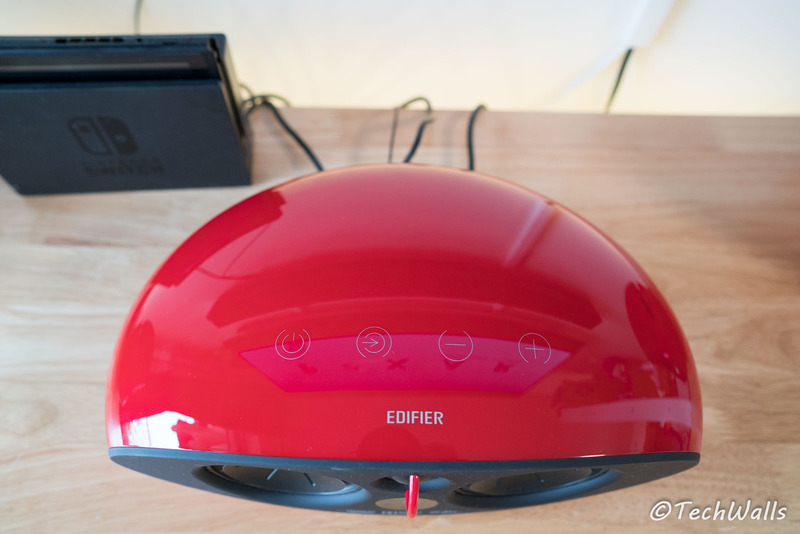 The Edifier e255 system comes in two color options which are red and black, however, we just can buy the red version in the United States. 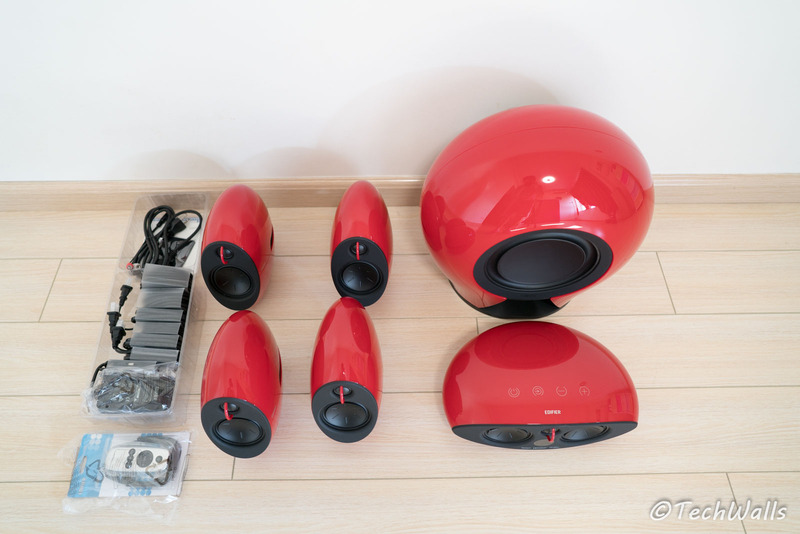 Fortunately, the whole system looks amazing in the red color with glossy finish. Out of the box, we have 6 speakers in total along with a remote control and a bunch of cables. Specifically, there are a main center speaker, two front speakers, two rear speakers, and a subwoofer. 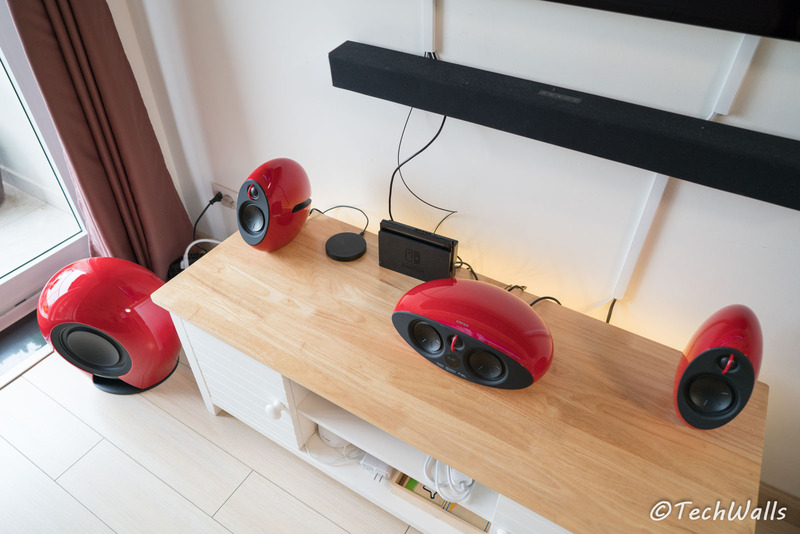 You might find the speakers familiar; This is because Edifier uses the same design as their previous speakers like the e235 or e25 Luna Eclipse. 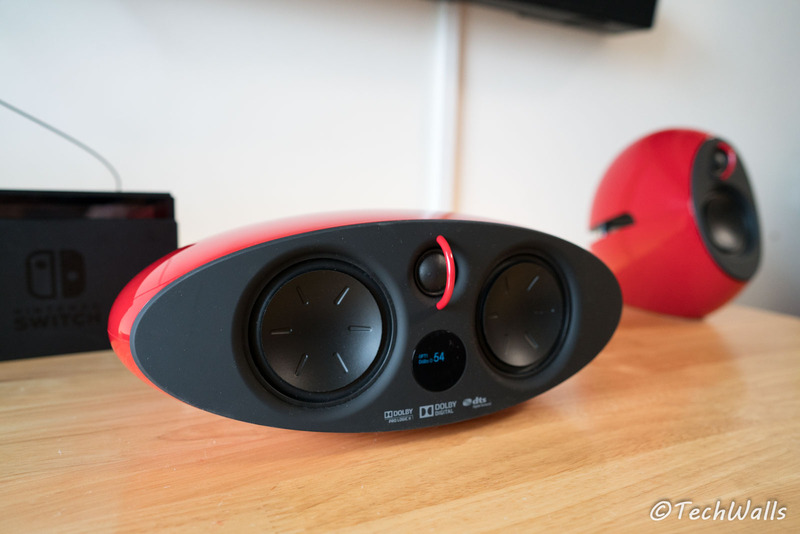 Edifier adds two rear speakers and a new center speaker to create the system. 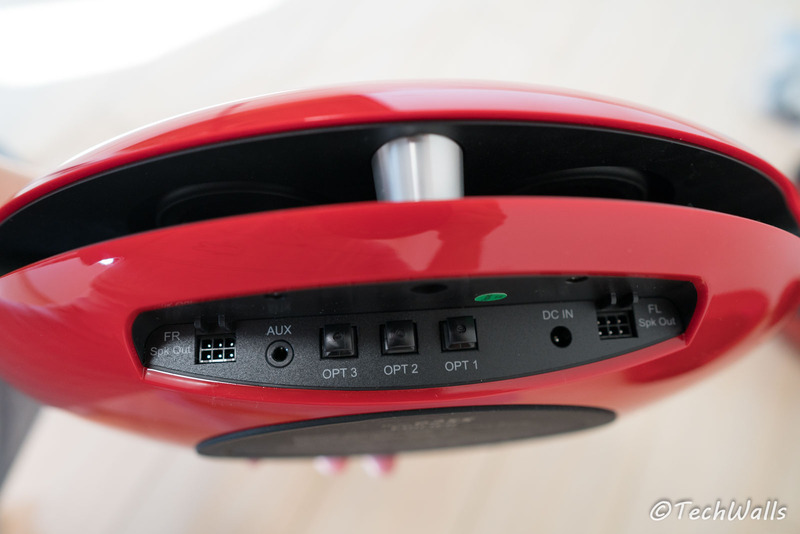 The center speaker is the primary unit and all other speakers will connect to this unit via a wired or wireless connection. Although the speaker system features some wireless components, it still uses many cables. The two front speakers need to connect to the center speaker via the included cables. Besides, we need power cords for the center speaker, subwoofer, and surround speakers. Finally, there is another cable to connect your audio source to the center unit; In my case, I connect this unit to my TV via the included optical cable. In terms of connectivities, I am a little disappointed since the Edifier e255 offers just a few choices. You will just be able to use either the Optical inputs or 3.5mm AUX input. The expensive system even doesn’t have Bluetooth for wireless streaming from smartphones. Setting up the system is pretty straightforward; I just plugged those speakers to power outlets and all of them would be synced automatically. Once you see solid lights on those wireless speakers, the system is ready to use. You can use the touch control on top of the center unit to power on/off, change inputs, or adjust the volume level. The remote control is more useful as it can adjust the volume level of each speaker and allows you to turn on Dolby Pro Logic II. The feature is quite useful when you play stereo content as it could use hidden audio cues to convert to 5.1-channel surround sound. I often enable this feature when playing music or content from Youtube. The total power output of the e255 is 400w and more than half come from the subwoofer. Previously, I used a VIZIO soundbar and I immediately felt the difference between the two systems when turning it on for the first time. The bass is so powerful that I have to decrease its power level to -7; Even then, the bass is still so overwhelming. I set up the system in a living room of around 400 sq ft and obviously, it is way too small for the speakers. Having said that, the sound is just a little muddy when I play bass-heavy tracks. I enjoy every second playing live performances or watching movies with the Edifier speakers. The mids are very clear and present while the surround sound effect gives me goosebumps every time I listen to acoustic or classical music. When I played some tracks from the “Vivere Live in Tuscany” album by Andrea Bocelli and “MTV Unplugged” by Shawn Mendes, I really felt like I am standing at the concerts right in front of the singers. Although the front and surround speakers are not really powerful, I don’t hear any distortion when cranking up the volume. The system is more suitable for a medium room since it won’t be able to fill the sound in larger rooms. I often have to set the volume level to nearly maximum when using this speaker. The speakers sound great when playing music but they are even better for watching movies. The bass is thunderous, the conversation is very clear, the treble is well tamed while the surround sound is so immersive. I watch a ton of movies and TV shows with the e255 and it is so difficult to get off the couch. I remember I had to turn my head around many times when watching the “The Haunting of Hill House” TV series; I felt like the footsteps or other noises come from behind or right next to me. The surround sound effect is amazing and this is truly the theater experience. 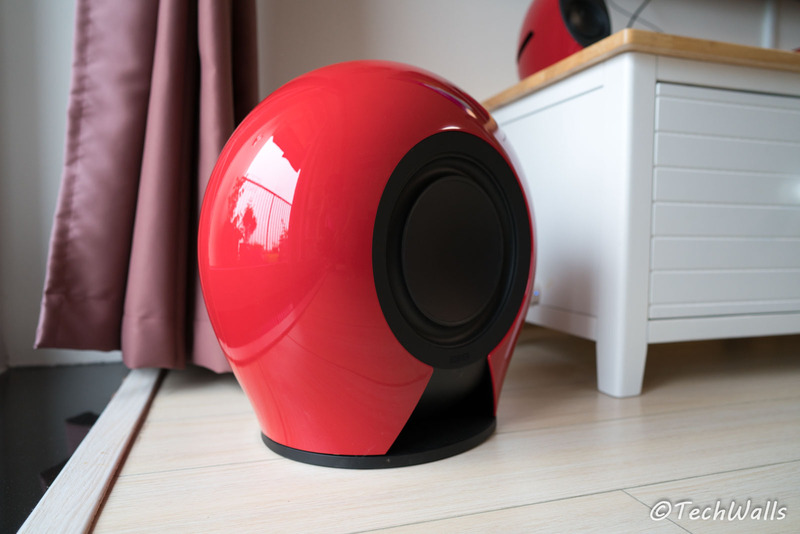 I thought that the lack of Dolby Atmos and DTS:X would be a huge disadvantage of this speaker, however, I figured out that this is not really a big issue. Most titles in my movie collection are still Dolby Digital or DTS content and the system supports both the 2 standards. Besides, investing in a high-quality Atmos system would cost much more than just $1,000 and my budget is not ready for this. Therefore, I will be happy with Dolby Digital 5.1 surround sound for a while. The Edifier e255 is one of a few surround sound systems that do not only sound great but also have a beautiful design. I highly recommend the system if you’re looking for a 5.1 system and setting it up in a 500 to 800 sq ft.
A gorgeous surround sound system. Thank you very much for the detailed review!! I love this Edifier e255 Luna E 5.1 Surround Sound Home Theater System! Will definitely order it when I receive my pay! I notice the price of this product is out of my budget, let me know if you have any idea about low budget sound home theater system. Thank you so much for the conclusion or the pros. I am planning for a home theater for my mum & dad wedding anniversary, Edifier e255 Luna E 5.1 sounds good. I was looking for a sound system like this for my new home but the problem is it is a little bit expensive. Is there any suitable Sound system for 350-400 sq feet within an affordable price? Thanks for your honest review and demonstrated the pros and cons. i am searching for sound system between 2000 to 3500rs. There is any sound system between these range?